One or two operator pallet dismantling bandsaw with electric/gas power, 60” to 96” width capacity, front/rear board catch options, trailer package option, rear/center drop table options, and 5 ¼” table height adjustment. 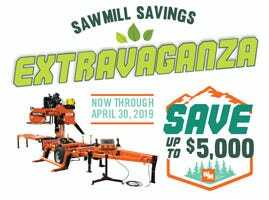 Designed for one or two operators, the Wood-Mizer Pallet Hawg® PD200 Bandsaw Pallet Dismantler is engineered for a full range of pallet recycling including pallet prep, repair, dismantle, and recovery. Available in 60”, 72”, 84”, or 96” wide table capacities, the PD200 also offers many customizable options to fit the needs of your operation including 10HP electric or 19HP gas power, trailer package, rear or center drop table, and front or rear board catch. Two easily removable pass back bars located above the blade allow for a quick transition between a two person and one person operation. Average production will vary per 8-hour shift but the PD200 is designed to dismantle approximately 400 pallets per shift with one operator. A pneumatic table lift has preset heights with 5-1/2” of travel below the blade to enable quick and convenient shifting between upper and lower cut points to easily adjust for block pallets, stringer pallets, or specialty pallets and skids. Due to the unique combination of high torque and low RPMs, the bi-metal bandsaw blade running at 2,200 fpm has an expected blade life of up to 1,500 dismantled pallets per blade which is nearly double the blade life of competitive pallet dismantling saws. A mechanical blade tension system ensures proper blade tension at all times unlike other dismantlers that use air or hydraulic for blade tensioning. Two removable wheel cabinets allow for easy access to the two 27” bias ply tires and blade guide assemblies for maintenance. Two operator remote stop buttons are available near the table height adjustment for safety and two built in fork pockets allow for easy loading and unloading of the machine for layout flexibility. 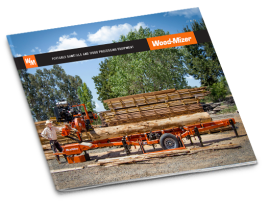 Built in the USA with premium quality components, the PD200 Bandsaw Pallet Dismantler is designed for low maintenance costs and years of trouble-free service.